A local resident discards a plastic bottle—just as he has done his whole life—with no perceivable effect on the environment. 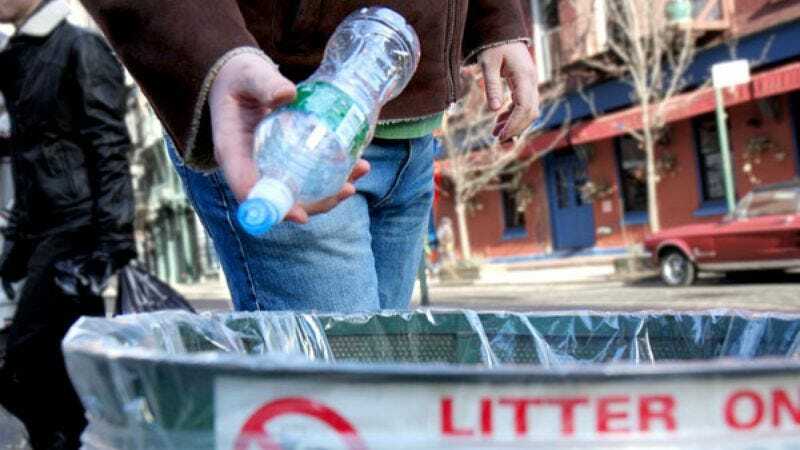 WASHINGTON—Wishing to dispose of the empty plastic container, and failing to spot a recycling bin nearby, an estimated 30 million Americans asked themselves Monday how bad throwing away a single bottle of water could really be. "It's fine, it's fine," thought Maine native Sheila Hodge, echoing the exact sentiments of Chicago-area resident Phillip Ragowski, recent Florida transplant Margaret Lowery, and Kansas City business owner Brian McMillan, as they tossed the polyethylene terephthalate object into an awaiting trash can. "It's just one bottle. And I'm usually pretty good about this sort of thing." "Not a big deal," continued roughly one-tenth of the nation's population. According to the inner monologue of millions upon millions of citizens, while not necessarily ideal, throwing away one empty bottle probably wouldn't make that much of a difference, and could even be forgiven, considering how long they had been carrying it around with them, the time that could be saved by just tossing it out right here, and the fact that they had bicycled to work once last July. In addition, pretty much the entire states of Missouri and New Mexico calmly reassured themselves Monday that they definitely knew better than to do something like this, but admitted that hey, nobody is perfect, and at least they weren't still using those horrible aerosol cans, or just throwing garbage directly on the ground. All agreed that disposing of what would eventually amount to 50 tons of thermoplastic polymer resin wasn't the end of the world. "What's one little bottle in the grand scheme of things, you know?" added each and every single one of them. Monday's plastic-bottle-related dilemma wasn't the only environmental quandary facing millions of citizens across the country. An estimated 20 million men and women wondered how wasteful leaving a single lightbulb on all night really was, while more than 40 million Americans asked themselves if anyone would actually notice if they just turned up the heat a few degrees instead of walking all the way downstairs and getting another blanket. Likewise, had they not been so tired, and busy, and stressed, citizens making up the equivalent of three major metropolitan areas told reporters that they probably wouldn't have driven their minivans down to the corner store. "Relax," thousands upon thousands of Americans quietly whispered to themselves as they tossed two articles of clothing into an empty washing machine and turned it on. "What are you so worried about?"